“Video game lore” seems like an oxymoron, at first. “Lore” suggests mystery, something known only to a few. Yet here we are, drowning in the stuff. So much of it taken for granted that it’s often a surprise when we look at a game’s lore and notice, like we did with Destiny five years ago, that some of it is really good. In games, “lore” is the catch-all word we use for ancillary storytelling outside of the main plot. It usually takes the form of in-game documents that are mostly concerned with giving a virtual world its own virtual history, or suggesting that there are things going on outside of the scope of your own little adventure. They can be epistolary, in the form of letters sent between two characters (the Deus Ex games, for example, are full of email accounts for you to pilfer through) or they can be more straightforward, like an encyclopedia for a world that doesn’t exist (consider the Codex in the Mass Effect series, full of entries that fill you in on a universe that you’re a stranger to). The most compelling kind of lore is a bit of a hybrid. Destiny’s Grimoire, a collection of digital “cards” that appeared in the game’s companion app, was a mix of straightforward entries, transmissions, and experimental short stories, all of which worked together to make Destiny—a notoriously story-light game—appear to have a much richer narrative than we initially thought. The peak was arguably the Books of Sorrow. Introduced in the first game’s Taken King expansion, the Books of Sorrow were a series of fragmentary passages in the game’s grimoire structured and written in the style of a religious text. They dove into the history of the feral, monstrous-seeming Hive you fought in the darkest reaches of the game and revealed them as having a tragic history, a shared faith, and a society that once looked drastically different from what we knew. But the Books of Sorrow weren’t only good for what was in them, they were good because of how we found them: Scattered throughout The Taken King’s Patrol Zone, The Dreadnought, as collectibles called Calcified Fragments. Find one during a mission or while solving a riddle, and you’d get another verse from the book, a short story from the Hive’s fall, or another chapter in the descent of the Hive leader who would one day become Oryx, the titular Taken King and the ultimate villain in that era of Destiny. It’s an approach that embraced the non-linear, circuitous way we play games like Destiny. Something poetic to ponder in the rote machinery of loot shooters, the germ of an idea that maybe there was a story beneath the skin of the halls you endlessly ran through to kill more Hive. Dare you dig deeper? That was essentially the appeal of Destiny’s Grimoire as a whole, but the Books of Sorrow was ambitious in a way we hadn’t seen before, a sweeping, opaque sci-fi fantasy about sisters who were betrayed and power that transformed an entire people. And it was completely possible to miss the whole thing, or only find part of it. This is partly what made it so compelling: Video games demand things from us, and a story that we have to actively piece together requires more space in our mind. Lore done right embraces this, eschewing straightforward encyclopedia entries for something more evocative. Granted, a lot of how well lore works in a game also depends on how engaging its surface-level plot is. A messy plot makes it that much harder to care about something ancillary, but if the story in the margins is good enough, it can make the mess one you want to sift through. All of this has become relevant again since the release of Forsaken, the moment that Bungie decided to pivot from the initial Destiny 2 approach of conveying lore through gameplay back to the cryptic entries the first game’s Grimoire became known for. The game has gone all-in on the kind of big, ambitious multi-part stories that first got us paying attention to its lore, like the space Western revenge tale Dredgen Yor and Shin Malphur and their notorious weapons, or the aforementioned Books of Sorrow. Diving into the Lore section of Destiny 2’s menu or companion app now feels like plumbing through a small library of short serial adventures—some melancholic, others full of royal intrigue, and others still dabbling in experimental bits of metafiction, like the Book of Unmaking, which follows up on both the Books of Sorrow and the story of Yor and Malphur. On its face, it’s an ancient Hive text, but it’s also accompanied by the notes of Guardians on a not-quite-sanctioned mission to decipher it, and ancient verse and modern scholarship dovetail to hint at cracks that could potentially spread through Destiny 2’s entire narrative foundation. Of course, it all leads to the promise of more loot in the end, with the narrative threads of the Books of Sorrow and the legacy of Dredgen Yor leading to the promise of more Weapons of Sorrow possibly being revealed, of which notorious hand cannon Thorn is one. But to have covetable new loot teased by a story that riffs on a science fiction version of the Bible that’s then weaved into another sprawling story of revenge that then, in the Book of Unmaking, takes a left turn into cosmic horror? That’s some serious narrative judo. It’s also risky: At some point, we want the foreground to become as compelling as the background, and the latter runs the risk of writing checks the former can’t cash. It potentially makes the game’s lore less accessible, a little more like lore in games that don’t do it as well: indecipherable to anyone who hasn’t already bought fully into it, presumptuous of your level of interest. It also might be trying to do too much work, introducing a sense of moral ambiguity to pretty much the entire infrastructure of Destiny 2. 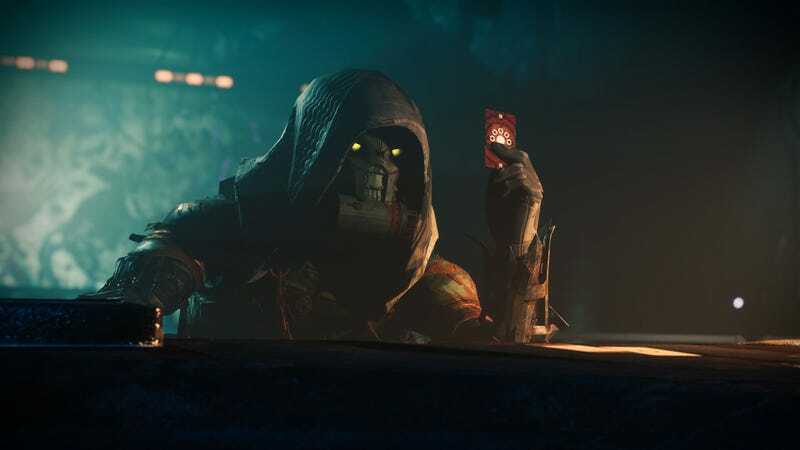 Lord Shaxx, the Vanguard, the Crucible, the Traveler—there’s potential here to upend everything about Destiny’s story as it’s been formed over the last five years. When a story is primarily told through lore, it feels apocryphal, something that can—and likely, will—be undermined by the primary text of the game. Dragging those two lanes of storytelling flirts with both immense payoff and great disappointment. It’s borderline reckless, but that’s what makes it exciting. You could even call it a gambit.